Congratulations on your fluffy, playful new family member! Initially, feeding your puppy may seem pretty straightforward. But there’s more to mealtime than many new pet parents realize. Just like a lot of humans, puppies would love a daily all-you-can-eat buffet, but it’s usually better to feed them at certain times and take away food between feedings. Keep reading to discover why a feeding schedule sets a new puppy up for success, and find out how often and how much to feed your new puppy at different growth stages. Growing pups need more calories, fat, minerals, and protein than adult dogs and should eat high-quality food formulated just for their age. Choose a food consisting mostly of meat and avoid unnecessary additives, such as dyes and flavors. Free feeding works for some puppies, but feeding schedules usually work better. Some pups will gobble down any food left out whether they’re hungry or not. With obesity rates skyrocketing in pets—one survey found more than half (56 percent) of dogs were classified as clinically overweight—you can help your furry best friend stay healthy by sticking to a routine. A feeding schedule also helps with house training. Puppies need to relieve themselves within 15 to 20 minutes after eating or drinking. If you feed your puppy at the same times every day and take her outside afterward, you’ll help minimize the number of accidents. 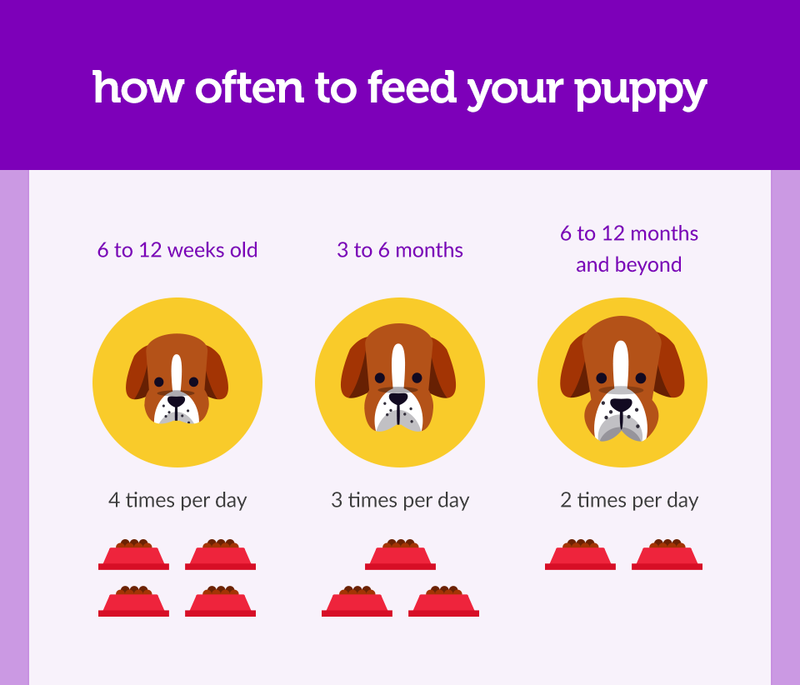 Use this general guide to help you know how many times a day to feed your new pup. What with all that growing they’re doing, puppies are hungry! Start out by feeding your puppy at regular intervals three times a day. More frequent, smaller meals are easier to digest and help keep your puppy’s energy levels steadier throughout the day. Around this time, your puppy’s body will naturally thin out a bit—and it’s no wonder with all that running, playing, and chewing! At the six month mark, you can transition to feeding your puppy twice daily—once in the morning and once in the evening. For most dogs, you can stick to this feeding schedule throughout their lives. But if your dog is a large breed with a narrow, deep chest such as a Great Dane, German Shepherd, or Saint Bernard, talk to your vet about continuing smaller and more frequent feedings. These dogs, especially males, are at a higher risk of developing a serious digestive condition called gastric dilation and volvulus syndrome (GDV). Smaller and more frequent feedings may help prevent it. Follow the recommendations on your food bag to know how many cups of food to feed your puppy per day. But keep in mind that the suggestions on food bags are based on an average puppy who does a normal amount of activity. Just like humans, dogs who exercise more or less than average may have different food needs. Most veterinarians advise waiting until a puppy is six to eight months old before exercising vigorously. After that, your puppy may need between 5 and 25 percent more calories if he’s especially active. (On the extreme side, the sled dogs who run the Iditarod Trail Sled Dog Race eat around 10,000 calories a day compared to an average, similar-sized dog who eats 1,250 calories per day!) Talk to your veterinarian if you have questions about your budding athlete’s calorie needs. Between four to six months, your puppy may become overweight if he’s fed too much or is not as active as normal. Regularly evaluate your puppy’s body condition to make sure he’s at his ideal weight. Here’s how to do it: Look at him from the top and side. From above, his waist should be clearly visible. From the side, his ribs should be slightly visible and his belly should tuck up. An overweight puppy will have a rounded stomach and no waist, and an underweight puppy will have visible ribs that jut out when viewed from above. 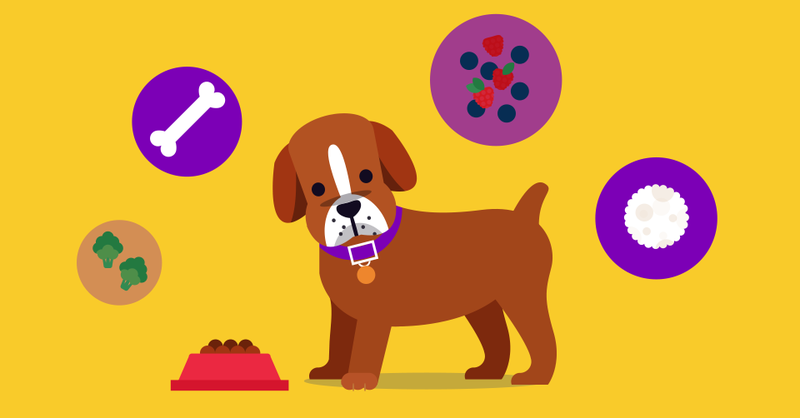 Dogs are strongly motivated by food, which makes treats a great way to train your new puppy. 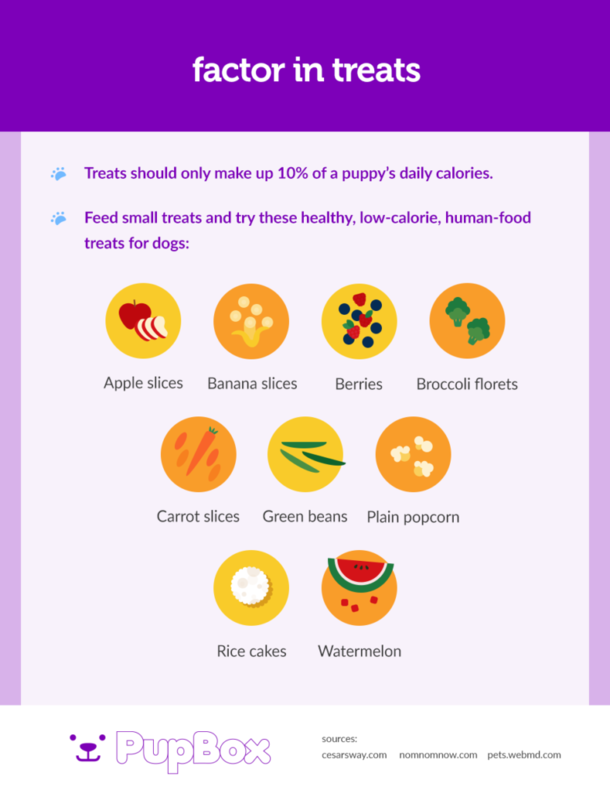 But it’s best to limit treats to 10 percent of a puppy’s daily calories to make sure he gets all of the nutrients he needs from his food. Use small treats or cut them into smaller pieces for training sessions. And if you feed your pooch a lot of treats, adjust the next meal accordingly. You’ll set your puppy up for a long, healthy life by feeding the right amount of a high-quality food at regular times. Get in the habit of regularly evaluating your puppy’s condition, activity level, and treat intake and adjust mealtime accordingly.